Ok, I’m just going to come out and say this. I know that as a professional food writer, I’m supposedly above such cursed impulses and wanton indulgences. But I really like pizza. Of all kinds. 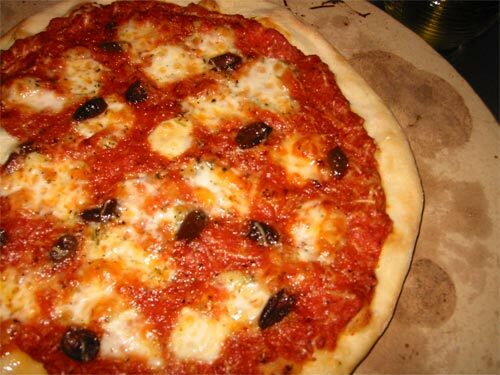 Preferably delicious, wood-oven, Naples-esque pizzas (see my recounting of pizza in Naples here). But when no pizzaiolo is close at hand to craft me a perfect pizza and I sit starving at my desk, I will give in to an occasional call to Dominos or res ort to a “gourmet” thin crust frozen pizza. That’s my truth for today. Something else happened a week or so ago. I was in one of those grumbly moods, creeping up to noon, when despite a kitchen full of perfectly edible food I felt that I simply had nothing to eat. I was on the verge of dialing Mr. D when something occurred to me. I had flour and yeast (crust, check). I had some leftover marinated mozzarella balls from a weekend party, tomat o sauce I’d made a week earlier that was in the freezer, a nubbin end of parmesan cheese and a jar of supremely delicious taggiasca olives from Ritrovo (toppings, check). I didn’t need to call Mr. D. I could make myself a pretty darn good pizza for lunch. And I did. For the record, a batch of pizza dough made with 1 cup of flour proved ideal for a single pizza. I made it by hand on the counter, the Kitchenaid would be overkill this time. While the dough set about its magical rising, I gathered my topping ingredients, then returned to the desk to get some work done. I also pulled down the pizza stone , a must-have for decent crust results. It took just a few minutes to roll out the dough, spread the sauce, scatter the toppings. On the preheated stone, my pizza cooked in just 10 minutes or so. Ah, delish. It was no Via Tribunali of course, but likewise miles better than any of those short-cut options. I don’t see myself making pizza for lunch all that often, but this first-time forray proved just how well I can eat midday with minimum fuss. And no phone call or guilty conscience required.